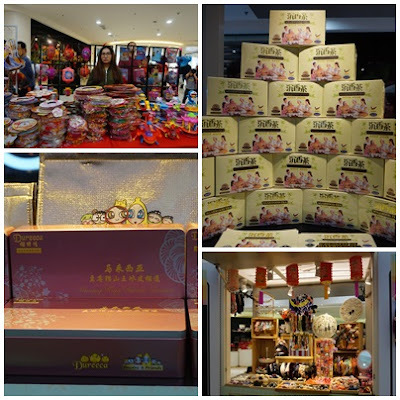 In conjunction with 60th Merdeka celebrations and Mud-Autumn Festival, Quill City Mall KL had collaborated with China Press to celebrate Mid-Autumn Carnival. The interior and exterior of the Mall has been decorated with giant patriotic decorations and Baba Nyonya lanterns to add up the atmosphere of the festival. The birth of Malaysia's Baba Nyonya heritage dates back to 15th century where Chinese immigrants married our locals and adopted the local ways of living. Baba Nyonya community retains many Chinese festival include Lantern Festival. Quill City Mall had brought us back to the scene of 15th century before Merdeka Day to indulge in the "Peranakan" culture in conjunction with our 60th Merdeka celebration. Baba Nyonya has its unique sambal spice as the filling for mooncakes which are wrapped in its golden texture while the song and dance takes place in the background, the festive of joy is usually shared amongst every race in the country. Dato' Ar. Michael Ong, Group Executive Director of Quill Group of Companies said that Baby Nyonya is Malaysia's unique culture with the combination of Chinese and local culture. 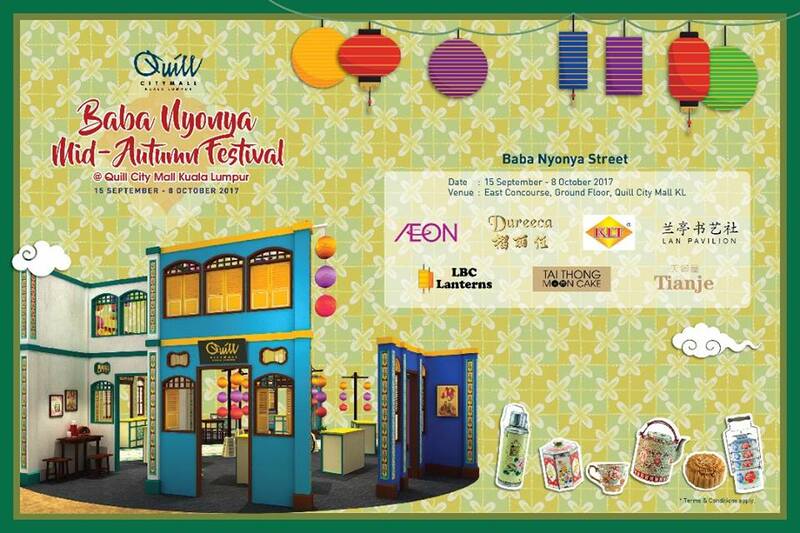 The Festival will commenced from 15 September 2017 (Friday) to 8 October 2017 (Sunday) in Quill City Mall KL. The East Concourse of the Mall had been decorated with the Baba Nyonya theme to promote Malaysian Chinese culture and to show Malaysia's unique multiculturalism. Mr Alan Cheong, Centre Manager of Quill City Mall KL said that the decoration in the Mall has garnered positive feedback in the social media, especially the giant patriotic decoration and Baby Nyonya lanterns, street and structure, Thousands of local and overseas tourists come to Quill City Mall KL for a photo taking opportunities in creating memories. They hopes the Mid-Autumn Festival can salvage our Chinese culture allowing everyone to celebrate the culture which belongs to the festivals of Malaysia. Do check out the major brands of mooncakes and tea, durian flavoured mooncakes, attractive lanterns, 4 treasures of the study, Chinese Painting and Calligraphy Gallery and Baba Nyonya food. Participation Vendors include Kam Lun Thai, Tian Je, Dureeca, Lan Pavilion, LBC Lanterns and AEON. Ybg. Dato' Yean Yoke Heng, Deputy Secretary General (Management, Ministry of Tourism and Culture Malaysia and Dato' Ar. Michael One together with Mr Ng Chee Kheong, COO of Quill City Group of Companues, Joseph Teo, Vice President, Marketing of Quill City Mall KL and representative from China Press had attended the opening ceremony. Famous young singers like Amy Wang, Jin Se, Fyone Tan, Stephanie Liew and Carrie Lee's perfomances had add more joy and colour to the carnival. Lion dance performancers, Festive drums performance, Chinese Art Demonstration, Chang Er Performance by Miss Cosmo WOrld are one of the many performnces not to be missed by shoppers and tourists. 1,000 beautifully imported QQ lanterns and 2,000 goodie bags worth RM15 were given to the public on 23rd and 24th September 2017. 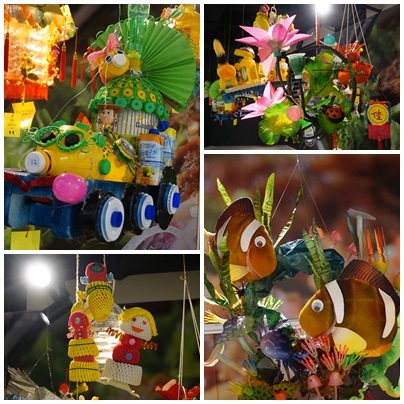 Quill City Mall KL and China Press also jointly organised a Kid's Creative Colouring Contest and Recycled Lantern Making Contest to encourage participants to make environmental friendly materials to produce lanterns. For shoppers who spend RM50 and above, you can join their Shop, Dine & Win 2.0 Lucky Draw to win cash vouchers worth up to RM3,000. You could also participate AirAsia Big Loyalty programme by snapping a photo of your receipt at the Mall and submit it via the AirAsia Big Loyalty App in exchange for the points. Shoppers get to redeem 2 BIG Points everyday for every RM1 spend on weekdays and 1 BIG Point for every RM1 spend on weekends. Members can accumulate points in exchange for air tickets, starting from 500 BIG Points. T&C apply. For more information, do log on to their website at www.quillcitymall.com.my, facebook page at www.facebook.com/quillcitymallkl and instagram at www.instagram.com/quillcitymallkl. Mommy Jane was amaze to see the beautiful of the decorations at Quill City Mall with the Baba Nyonya theme. There are lots of things to see and to purchase while understanding the cultural and the history of our country. There are lots of opportunities for a photo taking with beautiful backdrop and the lanterns around the Mall. Do visit the Mall for a different taste of fashion brand clothing stores, electronic goods, household items, beauty, boutique and various types of food for a friend and family reunion on this Mid-Autumn Festival. Nice. Tq for info mommy !! Salina, you're most welcome. Bring your children over to Quill City Mall to enjoy the spirit of Lantern Festival. Carol, indeed nice and we can read up the history of our country here too. Momi, thanks. Do drop by at Quill City Mall and take lots of beautiful photos ya.